When your clouds or servers reside in a network that sits behind a restrictive firewall or use a private IP range, you will need to set up a Virtual Private Network between Mist.io and your network to be able to manage them through the Mist.io service. Mist.io's VPN functionality is based on the OpenVPN protocol, which implements a Virtual Private Network (VPN) in order to create secure point-to-point connections to remote access areas. OpenVPN is capable of accessing private networks by traversing network address translators (NATs) and firewalls, while utilizing the exchange of keys in order to secure its VPN connections (or tunnels). Once you’re done, click on the Add button. Mist.io will create the tunnel. Click on it, and Mist.io will provide you with a bash script that you’ll need to run on your VPN client - usually one of the machines or the router of your private network. When deploying your VPN client, make sure that there are no firewall rules blocking incoming or forwarded Internet traffic. Your VPN client needs to allow incoming data and outgoing data to Mist.io. The UDP port that is used can be seen in the page above. 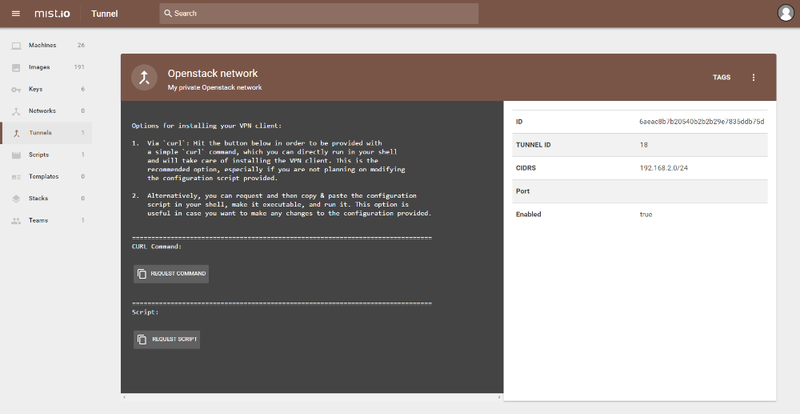 Additionally, make sure that the machine where the VPN client resides can forward packets to your local VMs. Please, ensure your firewall and IPtables rules (if any) have been properly configured. 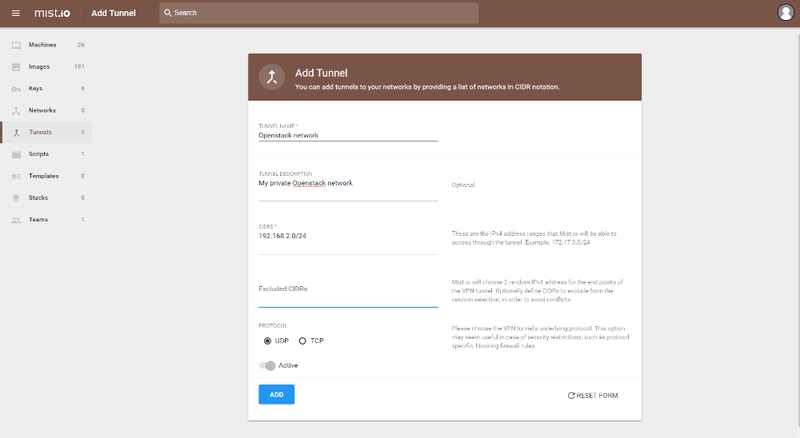 As soon as you have established your VPN tunnels, you can go ahead and add your infrastructure in Mist.io. Your private network IPs will be accessible for you by the Mist.io service as if they were public. Just go ahead and add your private clouds and perform actions on private VMs like you would normally do. You can retrieve a list of your established tunnels by invoking: mist list-tunnels. You can optionally add the --pretty argument to the aforementioned command in order to print the output in a nicely formatted table. 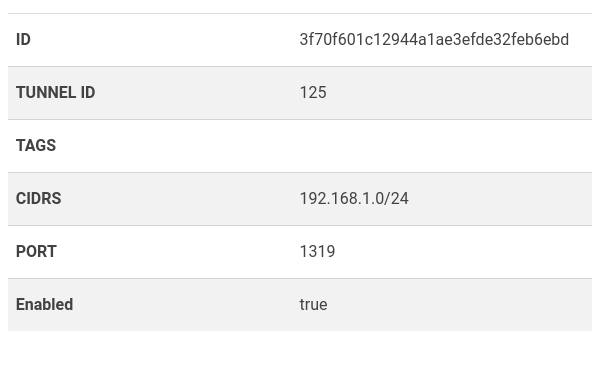 The first command requests the establishment of a VPN tunnel named “MyTunnel” via which the mist.io service will be able to reach the private networks 192.168.2.0/24 and 192.168.3.0/24. Additionally, the network 172.16.150.0/24 has been specified as a network to be excluded from the allocation process of IP addresses for the two VPN endpoints in order to avoid routing conflicts. For example, the 172.16.150.0/24 CIDR could represent a network that is directly attached to your VPN client, thus you would like to avoid an existing 172.16.150.x IP to be allocated to your VPN interface, as well. Finally, the newly established tunnel comes with the description “This is just an example”. The description and exclude- cidrs fields are optional. As soon as the newly requested VPN interface has been established on the server-side (the Mist.io side), the mist add-tunnel command will return the configuration script that needs to be executed on the client-side in order for the tunnel establishment to be completed. At this point, the client-side configuration comes in two forms. Firstly, a bash script will be returned, which needs to be run on your VPN client and will take care of downloading the necessary dependencies, setting up the VPN configuration files and security key, and starting the OpenVPN service. All you have to do is copy and paste the bash script on your VPN client, make it executable, and run it. The above command will edit the tunnel with tunnel ID e63fddace687u754aa9e66e4g56th257. Once you run it, the tunnel's name will be changed to “MyEditedTunnel” and Mist.io will also be able to access machines that sit in the 172.19.100.0/24 network. All tunnel IDs can be retrieved by calling the mist list-tunnels command. Tunnel IDs are required in order to perform actions on existing tunnels, such as editing, deleting, or retrieving a tunnel's configuration script.